Saturday 22nd - Friday 28th December ~ A Star from the East ? Well a short week, so a short blog but with a few more pictures. The weather has hardly been conducive to good photography lately with some really dark dismal days. Not surprisingly on such a busy Saturday, punctuality suffered on some services. L11-XL17 12.05 from Peterborough passed through Walton Highway with 37572 21 minutes late and 20514 on L12-XL18 (above) followed running 13 late. 37572 was changed over for 37575 at King's Lynn and this did the rest of the turn. the B7s were also late runners with 37159 on K15-XL02 (it had taken over from 37576 at 12.45) returning 10 late and going west the two regular B7 turns, K16-XL03 & K18-XL05 passed through 25 & 20 late respectively with 37158 & 37160. On Sunday 23rd, 37574 was in trouble again, this time with a faulty adblu sensor and 'lumpy' gears. It was in use for most of the day but was eventually replaced at King's Lynn by 37569. This had started the day on diagram 10 and was itself replaced by 37156. 37578 is having a scheduled brake modification carried out at King's Lynn, so may not be out for a while. So to Christmas Eve and an early shutdown as usual. This meant Y6-XL12 and L8-XL14 terminated at King's Lynn and K17-XL04 & K19-XL06 at Yarmouth and Lowestoft to compensate. 37568 on K14-XL01 was seen at lunchtime with a faulty destination display which resembled a snowdrift. Timekeeping was good except in the case of K19-XL06 which swapped 37564 for 37566 this afternoon and then ran 18 late to Peterborough. Later services were delayed by a fatal accident at Wendling which resulted in an unscheduled diversion. The X1 vehicles spent Christmas at King's Lynn except for 37565/71/75 & 37159 at Great Yarmouth and 37566/68/70/77 at Lowestoft. A normal weekday service resumed on Thursday 27th and the morning service ran very well. Services from Peterborough were delayed in the afternoon though with L12-XL18 (37566) which had been just 8 late going west returning 19 late, then came 37571 on Y13-XL19 12 late, 37160 on K14-XL01 26 late, 37569 on K15-XL02 6 late and 37156 on K16-XL03 23 late before things got back to timetable. Two turns changed buses for maintenance purposes, L10-XL16 had 37568 taken off for servicing and attention to its destination display at 10.15 and 37573 worked the rest of the diagram. Later 37574 was taken off K19-XL06 and 37157 went forward to Peterborough at 14.45. Over on the X2 there was a nice surprise with 32655 returning to traffic in its new colours. Typical of recent weather, 37564 dashes away from Walton Highway on Y13-XL19, the 14.04 to Lowestoft on Friday afternoon. Friday 28th was fairly straightforward with 37579 being changed for 37568 on K15-XL02 and most services running reasonably to time. That said, 37157 came through Walton Highway 18 late on the 14.15 Lynn to Peterborough (K18-XL05). Although this blog concentrates on the 'through' X1 services, the shuttles from Great Yarmouth and Gorleston can still produce almost anything as shown by the pictures below, all taken by Kieran on the afternoon of the 27th. Photographs by courtesy of Kieran Smith. Greetings to you all ! Thursday December 13th 2012 - Friday December 21st 2012 ~ Seven Years Bad Luck ? Pre Christmas traffic doesn't seem to have affected X1 service schedules quite as badly as in recent years. 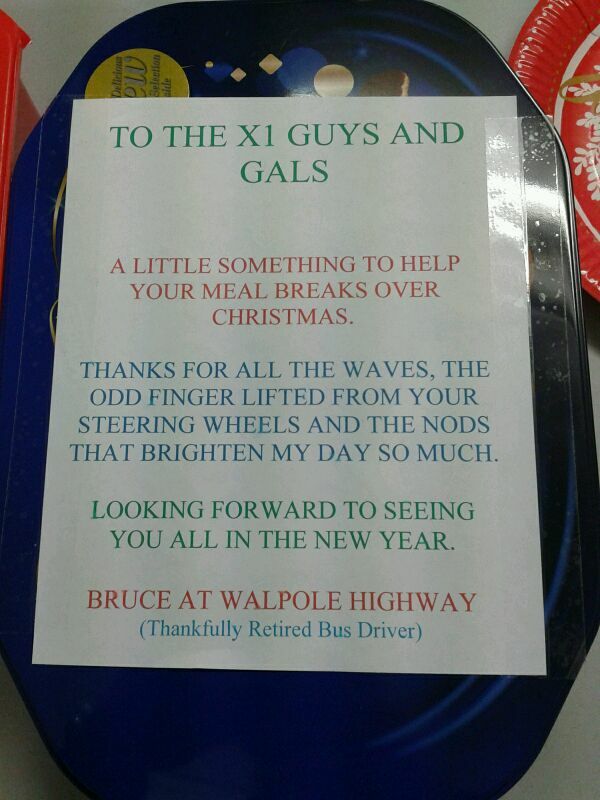 Here's the latest goings on from X1 land. Like many of you I suspect, I was given the worlds worst cold recently so info for 13th & 14th is a little sketchy as I was absent from my office window. On Thursday 13th 37572 was taken off Y6-XL12 in the evening, but it has nevertheless been out every day for a month, 37159 off Y9-XL15 finished the turn. Another swap to an eastbound service occurred with 37573 coming off K4-XL10 and 37568 taking over for the 19.35 King's Lynn - Great Yarmouth. On to Friday and there were numerous swaps with all the Geminis being involved at some point apart from 37574 which is still laid low with a gearbox problem. 37156 had a nightmare run to Peterborough on K16-XL03 departing Southgates 18 late, traffic then took irs toll and the bus was 29 late into Peterborough rail station. Despite quick loading and a 20 minute defIcit leaving Queensgate, 156 was 32 late at Wisbech. Des' next turn, K18-XL05 was 12 late from King's Lynn eastbound but thankfully lost little further time. This was with 37160 which had earlier terminated at Wisbech on the 14.15 from Lynn after failing to start. A faulty relay was replaced by fitters. 37571 suffered a puncture on Nar Ouse Way at 12.25 on L10-XL16 and K15-XL02 never ran from Lowestoft at 09.25, starting instead at Yarmouth at 10.12 with 37569. After a quiet period, Saturday saw a bit of excitement -firstly L12-XL18 managed to overtake L11-XL17 meaning that 37157 off L12 ended up on L11. This was not without incident as 37157 then became involved in a skirmish in Gorleston losing a wing mirror and mirror arm. On arrival in Yarmouth, Paragon coach 20515 was sent to the rescue and this then worked forward to King's Lynn. Initially it was intended to send it back east on L8-XL14 21.35 King's Lynn - Lowestoft, but this fell through and instead 20515 went back east on Sunday - I think 37156 travelled light from Yarmouth and the driver took the coach back, but this needs confirmation. 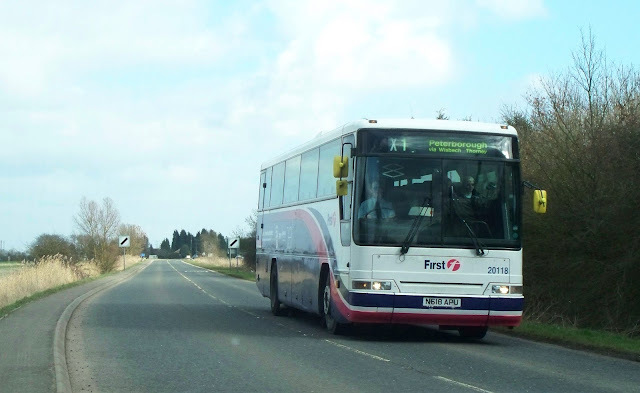 Back to Saturday and Tony & Marcus report the 16.45 King's Lynn - Peterborough, K4-XL10 with 37572, leaving Lynn via the A17 and then diverting through Tilney All Saints to regain the booked route, so presumably yet more delays on the A47. The Sunday service was entirely B9 worked otherwise with slight delays due to a broken manhole cover on the Acle Straight. Monday 17th : The X2 provided a surprise today with Norwich Gemini 36166 workung on the route - it is thought to be on loan whilst 32655 is away, presumably for repainting. 66126 was also about on the 12.40 Norwich - Lowestoft. 32200 and coach 20514 were viewed at Norwich by Malcolm on X1 shorts. Wisbech Xmas Market brought much extra traffic to the Fenland town today. 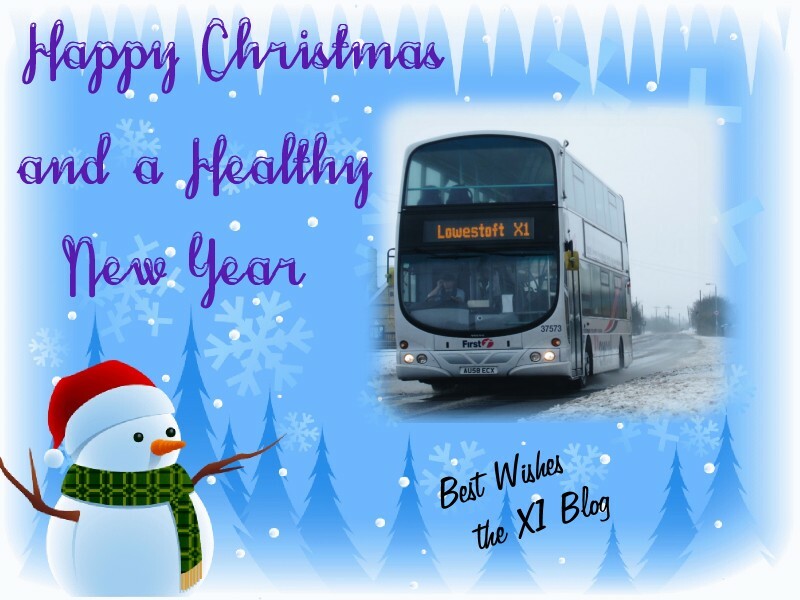 X1 services shuffled by fully loaded with around 7 minutes being average lateness this morning. My staff Christmas party was held at Terrington St. John Woolpack which was handy for viewing afternoon services between the Turkey and Christmas Pudding. 15 minutes was the maximum delay recorded by 37570 on Y13-XL19. Both K16-XL03 & K17-XL05 came back through the village eastbound 13 late but 37573 on K18-XL06 was just 3 late. There were more incidents tonight, 37567 on Y7-XL13 was caught in queueing traffic from Little Fransham to Swaffham McDonalds roundabout because of an rta. The service finally got away from Swaffham to Lynn at 18.23 (47 late). K1-XL07 burst at Acle tonight with a gearbox hose failure on 37574 and it then had to suffer the indignity of being towed into Great Yarmouth. This in turn led to an unexpected sight on Tuesday morning when Grahame Bessey reports Y13-XL19 08.15 Lowestoft - Peterborough departing with coach 20514. This was soon taken off however and a revived 37574 worked forward from Great Yarmouth. Delays of up to 10 minutes were noted on some services, but overall the standard of timekeeping was better than in recent days and certainly an improvement on previous years. An unexpected sight amongst the Geminis at Lynn this evening was Ex LT RM 39623 for MOT. Tuesday also saw 37565 on K15-XL02 swap over at lunchtime for 37564 which had been receiving an axle modification. To enable scheduled maintenance to take place on the B7s, K18-XL05 also had a change with 37158 giving way to 37159 at 14.15. Wednesday saw some patch up work to panels on 37565 and 37156, while 37566 had a starter fault which was rectified in time for it to work K5-XL11. A good day for timekeeping despite busy roads and heavy loadings. 37160 on Y9-XL15 was exceptional, being full when it passed me just 2 minutes late on the 10.18 Wisbech - Peterborough and it hadn't lost any more time when it went back to Lowestoft at 11.56. By all accounts, Friday was a dreadful day - major congestion and accidents on the route conspired to make buses run at irregular intervals. This afternoon, Peter was waiting for over an hour at Peterborough rail station with two arrivals going back east empty before a bus arrived at 16.10 and eventually left Queensgate with a full compliment of standing passengers. Cheryl was waiting at Thorney for the 17.35 to Wisbech and saw 37570, 37563 and 37158 head westbound before 570 returned to pick her up considerably late. At Lowestoft things weren't much better with Malcolm viewing Y7-XL13 arriving 29 late with 37566, 37567 on L8-XL14 arrived just 5 late and earlier 37158 on K5-XL11 had been 20 late in. Later L8 caught up Y7 at Great Yarmouth. Passengers transferred to 37567 on L8 and Y7 (37566) went light westbound to regain some time.On his morning outward trip, Peter had caught Y9-XL15 with 37159 which was 15 late and delayed due to a malfunctioning ticket machine. Below is a missive from Bruce to the X1 team and a rather festive listing of today's bus plan until the A47 intervened ! Having returned from Belgium, it seems ages since the last blog, but time passes so quickly at this time of year. Let's go to Wednesday December 5th to start. K4 (XL10) had a funny day, usually a B9 it started the day with 37159 but this got swapped at King's Lynn at 10.02 for 37156. Finally this evening 37576 off K3 (XL09) took the service forward to Great Yarmouth at 19.35. Morning timekeeping was all over the place due to delays between Wisbech and Peterborough. Lowestoft bound services noted were K3 (XL09) 12 late, K4 (XL10) 21 late and K5 (XL11) 10 late before services returned to timetable. Westbound services were OK until L10 (XL16) which turned up 29 late with 37564 following the temporary closure of Dereham Market Place, not surprisingly 37578 on L11 (XL17) following was just 9 late and by the time it returned it was on time. Later 37564 had recouped some time and was 14 late from Southgates to Lowestoft. Y13 (XL19) was also in trouble with 37570 (left) having to make a visit to Roundtree Way depot in Norwich for cleaning after passenger illness. The driver (DS) then took the bus light to King's Lynn but heavy traffic prevented any great progress and eventually it departed the garage at 12.02 for Peterborough. the remainder of the day was thankfully uneventful. 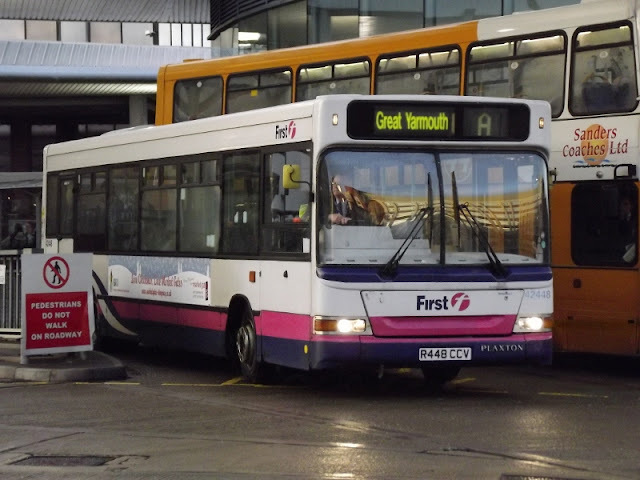 Thursday 6th was quieter and it looks like only Y6 (XL12) swapped vehicles, 37576 off for servicing and its replacement is believed to have been 37160. Y9 (XL15) was late departing Lowestoft tonight - due off at 15.55, it was still on the stand when 37571 left on L10 (XL16) at 16.25. The reason was an ABS sensor fault on 37158. Other X1s viewed at Lowestoft by Malcolm earlier in the day saw 37568 on K17 (XL04) arriving 14 late, K18 (XL05) with 37156 arrived 22 late and went out 19 late. Mid afternoon services were on time though. On to Friday 7th and one of those strange changes which leaves one wondering why. K2 (XL08) with 37563 was later 37577 and Y6 (XL12) the opposite. I suspect the swap occurred due to late running, but who knows ? 37571 on K15 (XL02) encountered heavy settling snow on the 09.25 ex Lowestoft, it was 4 late from Yarmouth and 9 late at Acle. The snow then turned to rain and departure from Norwich was on time. Later Des reports K1 (XL07) with 37574 being on time eastbound from the Southgates driver change at 18.07, but around 35 passengers joined at Norwich and slow loading resulted in an 11 minute late arrival in Yarmouth. There were several vehicle swaps on Saturday including 37574 again which started out on Y6 (XL12) and finished up on L8 (XL14). Sunday was the day when 37574 played up though - it has been a little unreliable of late. This time Des was driving it on XL09 07.08 James Paget Hospital to Peterborough when a 'check transmission' warning activated and speed was reduced to 45mph and even less on any gradient. A replacement in the form of 37159 was ready to work forward from King's Lynn to Peterborough at 11.50.This was not the only B7 out however and for the first time since August Bank Holiday Monday 2011, King's Lynn let a B7 loose on the Sunday service. The omens were not good though and whilst working the 10.10 Peterborough - Lowestoft it attempted to overtake a Range Rover doing 30mph (well even a B7 can do 49mph !) on the dual carriageway section between Walpole Highway and Terrington . The driver of the 4x4 then took leave of his senses and deliberately veered into the path of 157 causing an impact and forcing the driver onto the hard shoulder. Eventually thanks to the bus drivers cool head, the bus was able to rejoin the main carriageway. It is refreshing that some upstairs passengers came down to check that the driver was OK having witnessed the irresponsible actions of the other driver. The central reservation still bears the scars where the X1 was forced off the road. Fortunately the bus was able to continue despite the superficial panel damage. Slow motorists are nothing new in the Fens. Here 34825 on its last ever run on the X1 takes on a car on the old A47 between Walpole Highway and Terrington. January 6th 2005. Meanwhile I had a pleasant journey back from Peterborough rail station with 37564, only marred by a vociferous professional drinker with a mobile phone - thankfully he eventually ran out of credit, but not before he had regailed us with tales of his bawdy exploits. In view of the fact that everyone must know how to text, can we consider banning the use of mobiles on board for calls ? This sort of behaviour doesn't encourage travellers to repeat the experience. The new week started on 10th then with 37574 off the road with a gearbox problem, 37578 with an engine fault and 37569 with an adblu fault. This meant servicing commitments had to be juggled and 37570 was done first thing to enable it to operate K5 (XL11), while 37566 had to work K3 (XL09) and then be positioned for its maintenance. Fortunately, everything else was on best behaviour. L10 (XL16) was viewed heading for King's Lynn at 22.20 with 37156 in darkness, so presumably minus any passengers. On the X2, 32654 returned to service in the new First livery. I was back at work on Tuesday when I saw all 19 turns and most ran to time - once again L11 (XL17) was late with 37159 14 down departing Wisbech for Peterborough and K16 (XL03) 13.48 to Peterborough with 37573 was also 14 late. 37578 was tried out on K2 (XL08) but didn't complete the turn and 37577 off Y7 (XL13) worked back to Lowestoft at 18.35. I took a friend to catch the 08.03 from Walpole Highway to Peterborough this morning (K5 - XL11) and 37572 arrived bang on time but with its destination display having reverted to the standard style instead. One of those incidents which you always expect to happen, but which in fact very rarely does, occurred this morning when Cheryl texted to say that Y6 (XL12) 08.48 Wisbech - Peterborough and K3 (XL09) 08.56 Wisbech - Lowestoft both arrived in the bus station proclaiming Peterborough on the front. This was soon rectified and 37156 was seen departing correctly displaying Lowestoft. One item of note today was noisy 37160 performing on Y9 (XL15) - it was 6 late goimg west but came back slightly early - definitely a red letter day. 37157 however, was seen arriving Lowestoft 15 late on Y7 (XL13). 37159 is now back after attention to its engine. It is seen here getting a wash at King's Lynn on Tuesday evening after arrival on L11-XL17. Photo taken by kind permission of First. Finally then to Wednesday 12th and a nice day with any delays reported all being less than 10 minutes in the west. No swaps reported either. It was quite exciting for X2 passengers today though, when the usual suspects were partially ousted by 66126, 34114 and 34155. Thanks to Michael Bryant for the gen.
A quick catch up before I have a short holiday. Monday 26th saw 37577 having a new window fitted and 37570 stopped at King's Lynn for servicing. 37159 has gone to Volvo at Norwich and is rumoured to require a new engine which sounds serious. Low point of what was otherwise a good day for the X1 was L10 with 37158 departing Wisbech 5 late on the 10.48 to Peterborough and then a big gap until L11 finally appeared with 37160 at 11.45, 25 late. 37574 on L12 was on time just 5 minutes behind it. Malcolm viewed 32203 at Lowestoft - it came in from Martham and then worked the 15.03 X2 to Norwich departing 10 late. 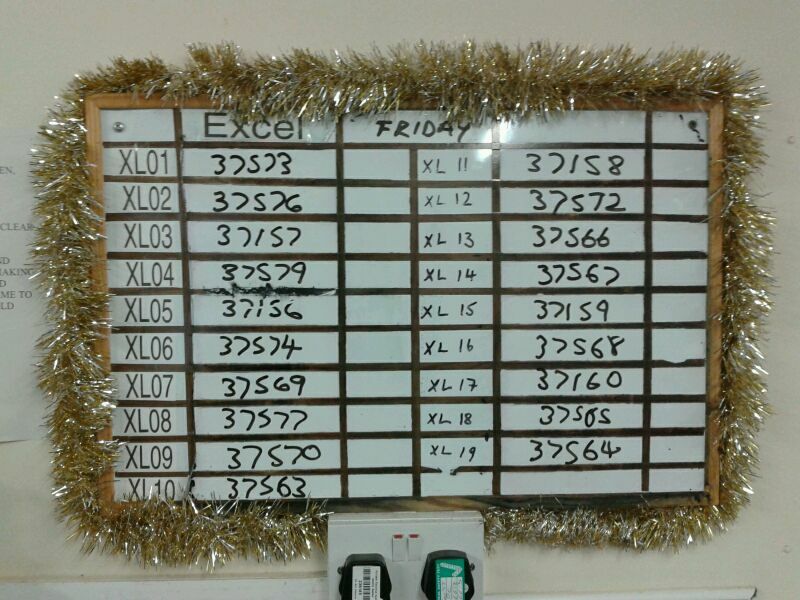 Tuesday 27th witnessed swaps on three turns, K5 had 37569 changed for 37157, L10 had 37578 taken off in favour of 37572 and Y13 began the day with 37573 finishing with 37578. Bruce was monitoring today and says K15 did not pass him westbound, but came back spot on time with 37574. Another surprise at Lowestoft was the appearance of President 32200 on the 10.38 X2 to Norwich, while Michael Bryant reports the increasing use of Palatines on this route. 37571 was in trouble tonight whilst working the last leg of Y7 from Lowestoft - King's Lynn where it is due to garage after arrival at 18.07. 571 had low oil pressure at Acle. It managed to limp to Toftwood where a Lynn fitter attended to effect repairs and eventual arrival in Lynn was 45 late. Time for some chaos then and Thursday certainly provided that. A crash at Necton shut the A47 for recovery work from 10.45 until 12.55 badly affecting services. Y13 11.45 King's Lynn - Peterborough looks to have been a non-runner. This turn arrived in Lynn late with 37566 and 37568 then took over later on the 14.32 to Lowestoft. K15 12.45 King's Lynn - Peterborough came through Wisbech 22 late with 37566 (off Y13) having replaced 37568 at Lynn. K16 with the ill starred 37160 fared even worse and set sail for Peterborough 27 late at 14.15. Not sure what time 37579 on K17 went westbound, but it returned 32 late. Several buses changed turns including 37571 which came into Lynn on Y9 at 09.37 and then went to the garage. 571 was available again to work K5 forward to Lowestoft at 10.32, this service had come in with 37574 which was then stopped for repairs including a faulty adblu sensor and airbags. At midday there was a strange carry on when 37578 on L8 arrived in Lynn only to turn round and work K14 back to Peterborough. Similarly, 37564 off K14 promptly went back East with L8. There was still time for one more swap with K2 which was 37573 having a starter problem, so 37569 which itself had been having attention to its adblu sensor was made available for the 15.45 King's Lynn - Peterborough. Finally Des reports 37570 on K4 arriving at King's Lynn about 30 late from Peterborough this evening. Departure to Great Yarmouth was 28 late and even with Mr. Speed at the controls, heavy traffic meant little time was recouped and the service was 15 late from Norwich - this after his inward service Y7 had also suffered on the congested A47, 37156 was 4 late from Lowestoft and 26 minutes in arrears by the time it got to King's Lynn. 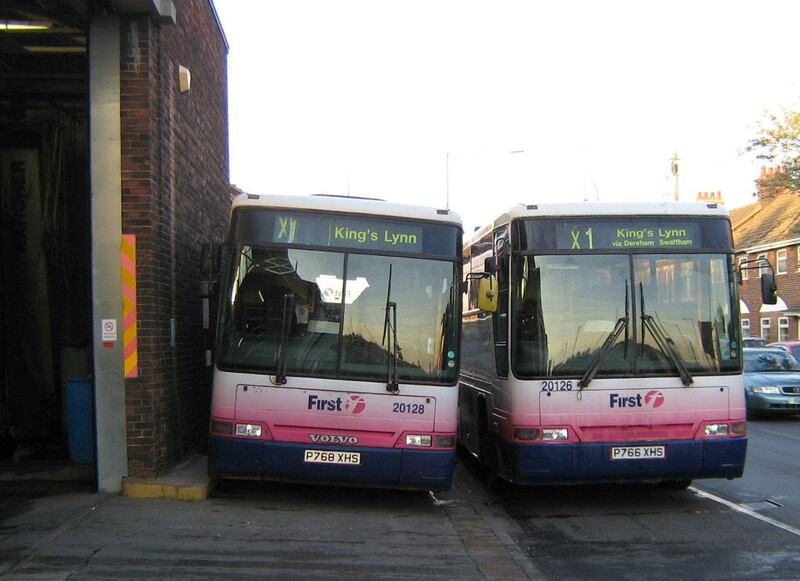 There was another fiasco on Friday which brought bus services grinding to a halt in King's Lynn. Emergency surface repairs to the A47 saw the Saddlebow - Hardwick section closed eastbound at lunchtime with diversions via Nar Ouse Way and Hardwick Road. This soon resulted in drivers becoming displaced and some long delays were recorded. To cap a miserable week for 37160, it began the delays and was 20 late heading west on L11. Y13 with 37564 went to Peterborough 15 late but Friday traffic saw it lose a further 10 minutes by the time it came back eastbound. Both K14 and K19 appeared to be victims of the disruption and neither passed Bruce or myself. The delays continued into the evening and L12 which is due to depart Lynn for Peterborough at 20.50 was allegedly 90 minutes late with 37563, so 37160 off L11 worked the turn. In addition to these delays, 37158 expired at 16.00 near Norwich with an air leak whilst working Y9 and fitters had to attend, so all in all, a day to forget. At least Saturday passed off smoothly with just a single vehicle change reported, this being on K17 which started with 37568 and ended up with 37577. Most services ran well, but 37157 on L11 was 22 late eastbound through Walpole at 13.28. Next day 37566 on the Sunday turn supplied by Lowestoft suffered a broken upper windscreen en route and 37157 was wheeled out to replace it. The new week began well with just a single swap involving K14 which had 37568 (adblu sensor) taken off in favour of 37574. The latter had been undergoing heavy repairs since last Thursday. All buses ran pretty much to timetable with a couple of exceptions, these being 37573 on L12 which was 11 late heading west, but 25 late returning past Bruce. This evening the lost time had been regained however and 573 was seen heading home on the 22.10 ex Peterborough in good time. 37160 is really going through a jonah phase at the moment - today she was seen departing King's Lynn 28 late on L11 showing 'Not In Service' on the front but with passengers on board. 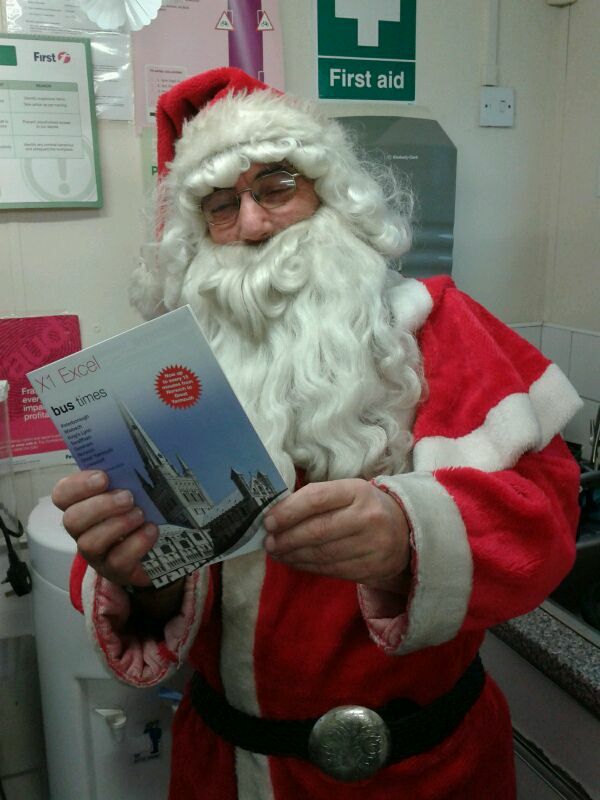 The service looks to have missed Wisbech altogether ! At Lowestoft there was a surprise when coach 20515 appeared for the 11.15 1a to Martham. X1s viewed by Malcolm included K17 with 37579 which was 19 late in and departed 9 late on the 10.25 westbound. 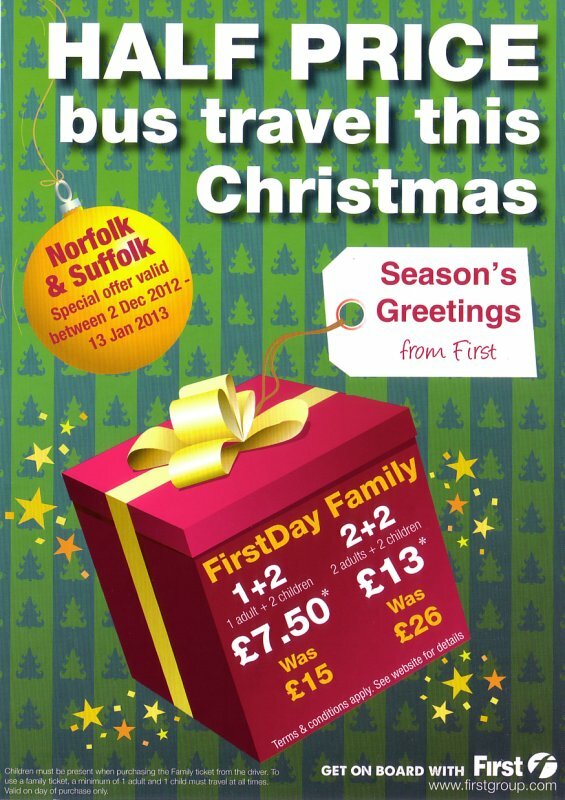 Finally to Tuesday December 4th and all services ran OK except L11 (again !). 37574 was 19 late on the 11.18 Wisbech - Peterborough. 37159 was returned to King's Lynn garage from Volvo today pending return to service. Finally Colin White writes "Hi Gerard, here’s something for the blog. Whilst there are roadworks and traffic lights in the vicinity of the Magdalen Square bus stop a temporary bus stop has been placed outside the Magdalen Way shops but it appears no one has actually told the drivers that it is there. (See photo). I’ve just witnessed a lady waiting there for the 11.15 X1 and it just sailed past, she had to run up to it sitting in the queue of traffic waiting at the traffic lights. There is no mention of the road works on the First Website so maybe an entry on your blog might help. The road works are due to end this Friday. I have only seen two Service 8 buses actually stop at the temporary one". Apologies for the paucity of pictures this time - I'm afraid it is past my bedtime. Next blog when I return. Monday November 19th - Sunday November 25th 2012 ~ The Census ! A fairly typical week on the X1 with nothing ground breaking happening - unless you know different ! Monday 19th was my day off, but Bruce kept a look out and the service seemed to run well. Sidelined buses were 37156 (ABS fault), 37569 (whellhub and panels) and 37564 (safety service and gearbox fault). This meant everything else had to behave and it looks like that's what happened. Tuesday was one of those dark dismal days which have been prevalent lately. Punctuality was sporadic with some services running up to 10 minutes late and with Y6-XL12 05.50 from Great Yarmouth (37572) seen leaving Wisbech 16 late westbound and 10 late returning, while the afternoon's poor performer was K17-XL04 13.45 King's Lynn - Peterborough which was 16 late with 37579. At Lowestoft K15-XL02 was seen arriving by Malcolm 20 late with 37570 and this then departed 12 late westbound. 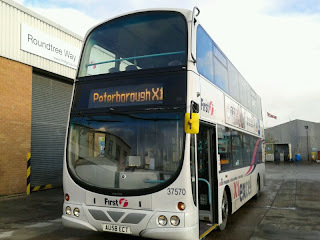 I had to go to Peterborough myself this afternoon, so took the X1 (why would anyone take the car I sometimes wonder). 37575 was my transport on K19-XL06 which ran pretty close to time and I came back on K2-XL08 with 37563 - I had expected 37573 but this had been changed at Lynn to fit in servicing requirements. I timed the journey back out of interest to see how the bus fared in the evening peak. We were dead on time away from Queensgate at 17.19 and left the City via Bourges Boulevard and the northern bypass. This was a good move since I had arrived via the Boongate route where temporary lights were in operation for roadworks and this would have caused a lot of congestion in the peak. Nothing untoward hindered us greatly with just the usual rush hour traffic one would expect at 17.30 and we joined the alternative route at Eye in 11 minutes from the bus station. We did however, totter along between the roundabouts from Eye to Eye Green and this short section took us 3.5 minutes. Our arrival at Thorney was in a few seconds under 20 minutes, so the peak time traffic had succeeded in us losing 5 minutes on the schedule. Stops at Thorney School, Thorney Toll and Guyhirn to deposit passengers didn't lose us any more time and we were still 5 down from Guyhirn. An average run down the A47 and through the outskirts of Wisbech saw us arrive in the bus station in 43'17" from Peterborough - the booked time is 37", so a loss of just over 6 minutes on the timetable about which there was nothing whatsoever the driver or the capabilities of the bus could have done to improve. 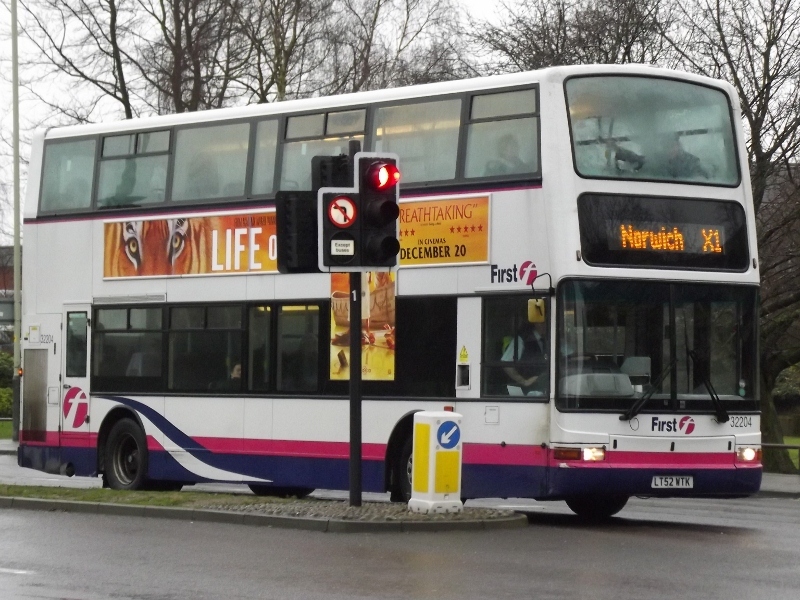 37156 was back on the road today on K3-XL09 after its recent misdemeanours. There seems to be at least one day each week where the A47 grinds to a halt due to either accidents or roadworks, but on Wednesday morning it was the fault of Norfolk County Council who had acted on someones bright idea to carry out a traffic census on the eastern approaches to Norwich. All manner of chaos resulted with queues of 50 minutes being reported at one stage until the census was abandoned. Naturally the X1 service was embroiled in all this, but the powers that be kept calm and minimum effects were felt at the western end of the route. My observations coupled with those by Bruce, show that the first service delayed was Y9-XL15 with 37158 - this departed from Wisbech heavily loaded running 32 minutes late - the obvious thing for the operators to do was to then run this service as L10-XL16 and this they duly did. The bus which had come in to King's Lynn on L10 was then terminated and kept to work Y9 back eastbound at 12.32 - 'simples' as our friends the meerkats would say. Delays began to accumulate at Lowestoft too, noted by Malcolm Hicks were 37567 leaving 10 late on K15-XL02 then K16-XL03 arriving 18 late with 37573 and this left 15 late to Peterborough on the 09.55. K17 arrived with 37575 'not in service' at 10.27 to work the 10.25 departure. Elsewhere on the route, K4-XL10 08.35 from Peterborough was delayed en route and came into Wisbech 22 late with 37569 and later 37572 on L12-XL18 was 14 late going west. K16-XL03 was 37573 13 late westbound but things then settled down. 37565 on K3-XL09 16.15 from King's Lynn was seen at Walsoken running exactly 30 late followed by K4-XL10 and 37569 which had recouped most of its morning loss, now 7 late. Earlier 37574 on K17-XL04 had come to a halt in Dereham with a water leak and 37575 was sent out to take over. A tacho fault on 37576 saw it make an early morning trip to Volvo at Norwich for rectification. This evening I travelled from Walpole to King's Lynn on 37569, now back on time. Returning I boarded L10-XL16 -still with 37158 from the morning's swap and departing South Gates spot on time, we then diverted into Vancouver Avenue garage for fuel. This cost us about 4 minutes but our driver seemed intent on doing what he could with 37158 to make up (or at least lose no more) time. It was pleasantly warm on 37158 in contrast to the damp interior of 37569. Thursday was much better for timekeeping and only two of the 19 turns seen were running appreciably late. L11-XL17 with 37579 was 15 late on the 11.18 Wisbech - Peterborough and later 37564 on the 14.18 (K17-XL04) passed me 19 late. 37159 was removed from Y9-XL15 with a fault this morning and 37565 replaced it, while K16-XL03 had a lunchtime swap at Lynn with 37574 replacing 37575, but otherwise things ran well. Roadworks on the King's Lynn bypass saw one carriageway reduced to a single lane on Friday and the Southgates webcam revealed L11-XL17 with 37158 emerging from the South Lynn exit onto the roundabout having taken this route to avoid the delays. 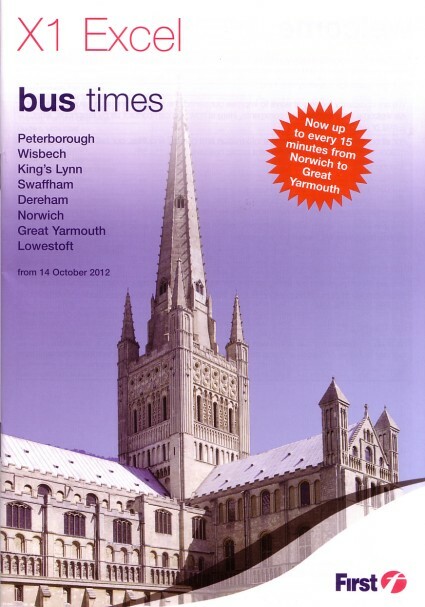 It was seen at 13.32, the time that it should have been leaving the bus station for Lowestoft. 20 minutes later, another B7 on a test run from the garage was seen arriving back via this route. 37571 came off K16 at lunchtime for servicing with 37575 replacing it. Most services ran pretty well today, but 37568 on Y13-XL19 which had been 4 late going west was delayed after this and came back into Wisbech 23 late to work the 13.56 Wisbech - Lowestoft. Similarly 37569 on K17-XL04 was 7 late going to Peterborough, but 17 late coming back and 37156 on K18-XL05 had lost the same amount of time too. A47 accidents and dismal conditions resulted in K4 with 37578 being 17 late on the 16.45 Lynn - Peterborough. There didn't appear to be any bus swaps today. The Saturday service ran very well until late afternoon when a blip saw 37572 on K17-XL04 come into Wisbech 17 late from Peterborough and the 15.48 westbound (K1-XL07) with 37158 was 21 late. Otherwise a commendable effort by all concerned. 37159 has had to go to Volvo at Norwich after suffering engine failure and 37569 & 37571 were the two spare buses today. Sunday 25th saw an unfortunate incident befall 37577 when it was working the Sunday XL01 diagram. It was the victim of a vandal attack with a rock hurled through the upper deck rear window near Dereham. Nobody was injured as luck would have it and 37570 and later 37156 took over the turn. 37579 working XL10 was seen arriving at the South Gates at 13.01. This turn is notorious for late running in from Lowestoft. It then works the 12.50 King's Lynn - Peterborough. Have Your Say on the A47 with the EDP. Click this link to follow the Eastern Daily Press day of monitoring the A47. You can also vote on improvements to the road. Friday November 9th - Sunday November 18th 2012 ~ Cracks Appearing ? The past week has seen much swapping of buses chiefly due to unexpected defects, though it is fair to say that this has not had too detrimental effect on the timetable. The B9 Geminis have been incredibly reliable over the past 4 years and have exemplified the faith which First Group put in them. Nevertheless, signs of age are now beginning to appear. Going back firstly then to Friday 9th and 37156 was in trouble on L11-XL17 when it's alternator packed up at Blofield, for a while causing an obstruction and meriting an announcement on Radio Norfolk's traffic news. 37571 was sent out as replacement and completed the turn. 37569 on K15-XL02 managed to do most of its diagram before it suffered a water leak and 37160 off K16-XL03 took over for the last leg back to King's Lynn from Lowestoft. The day's delays were up to ten minutes at times, but nothing too serious and relatively good for a Friday. 37570 was switched from Y6-XL12 to K5-XL11 to get it in the circuit for an exam at King's Lynn on Monday. 37565 took Y6 forward at 08.15 and 37571 came off K5 at 10.30. Both 37563 and 37578 had repairs completed by the Volvo man today. At Lowestoft 34155 was being used on the 09.38 X2 to Norwich. Saturday 10th saw 37563 back in service taking Y6-XL12 forward from Lynn to Peterborough at 17.45 in place of 37574 (believed to be because of a broken window). L11-XL11 changed 37569 for 37156 at some point today. Otherwise little of note to report as was the case on Sunday. The new week began on Monday 12th with a reasonable day for punctuality, but wet misty conditions may have contributed to an accident mid afternoon which saw some services diverted via Tilney All Saints to avoid the obstruction on the Pullover Road. K19-XL06 & 37563 and also K1-XL07 with 37579 were 12 late from Wisbech followed by K2-XL08 and 37578 running 17 late. Earlier 37568 was 10 late on K15-XL02 13.18 Wisbech - Peterborough, but made up some time and went back east only 3 late. It had obviously been delayed early on as Malcolm reports it arriving in Lowestoft 13 late before working the 09.25 to Peterborough. A whole host of new advertisements have adorned the fleet today for the films 'Nativity 2', 'Silver Linings'. 'Alex Cross' and 'Great Expectations'. Ironically, the latter is now on 37575 which passed me (below) running 8 late on L8-XL14 09.48 Wisbech - Peterborough following a no-show by Y7-XL13, which later came back from Peterborough as booked with 37577. Neither Bruce or myself saw it going west so I guess it must have travelled light from Lynn to Peterborough for some reason. Y9-XL15 came into Lynn from the east this morning with 37565 and this was changed here for 37157. Shortly afterwards though 37567 on L12-XL18 required changing as it had an adblu fault and 37565 ended up on this turn. Another casualty on Tuesday 13th was 37564 which came to grief in Great Yarmouth while working L10-XL16 eastbound - binding brakes caused by a seized rear caliper being the cause. This evening 37157 took its place on the 19.50 King's Lynn - Peterborough. Earlier K1-XL07 which had started out with 37566 had this replaced by 37157 commencing with the 10.02 Lynn - Lowestoft. On arrival back at Lynn at just after 16.30, 37566 was fit to resume the turn. Tuesday was a good day for punctuality only spoilt by the B7s ! 37156 had already been delayed by heavy loadings further east when Des took it forward from King's Lynn at 09.50 as Y9-XL15. Departure was 15 minutes late and on arrival in Peterborough it went straight to the rail station to drop/ pick up. Going back east it was just 7 late from Queensgate and 5 late back into Lynn, so well done that man ! The aforementioned adblu fault kept 37567 out of service but it was due a safety service anyway. Both 37569 & 37577 had attention to water leaks before they could start the day on K4-XL10 and K19-XL06 respectively.The last two X1 buses to sport the controversial Stonewall advert , 37564 & 37568, both had them removed today. I say controversial as apparently according to online news sources a driver in Yorkshire refused to take a bus forward because of the ad ! Timekeeping on Wednesday was fair, nothing in excess of 12 minutes lateness being recorded and there were no swaps which is good to report. 34155 was once again in use, this time on the 14.38 Lowestoft - Norwich X2. So to Thursday 15th when I was away from the route working at a polling station. Bruce gave a full report and nothing untoward seems to have happened, save the no show by L10-XL16. This evening it was 37563 as booked, so not sure what happened there. K4-XL10 had 37573 for most of the day, but this evening it was in Vancouver Avenue so clearly did not work the 19.35 King's Lynn - Great Yarmouth. At Lowestoft Malcolm saw 37577 arrive 12 late on K15-XL02 and today 34155 was employed on the 09.08 X2. Friday was hit and miss for punctuality. most services ran fairly well, the exceptions being 37577 on K5-XL11 09.05 ex Peterborough which had lost 19 minutes by Wisbech. 37160 on L11-XL17 was 14 late on the 11.18 Wisbech - Peterborough and 37564 on L12-XL18 was 22 late, reduced commendably to 15 late returning eastbound. K14-XL01 which is notorious on a Friday came through eastbound 14 late with 37567. Later in the afternoon 37159 was 18 late on K18-XL05 14.15 King's Lynn - Peterborough, 37563 13 late on K1-XL07 15.15 and 37566 13 late on K2-XL08 15.45 from Lynn. 37157 had a good day for a change - it was spot on schedule with K3-XL09 08.56 Wisbech - Lowestoft and only 4 late on the return leg this afternoon. Further east, 37572 was 20 late arriving in Lowestoft on K17-XL04 this morning, so had done well to be only 4 late when seen by me at Wisbech later on. 37156 was intended to work K5-XL11 this morning, but it was stopped with an ABS modulator fault, so 37577 deputised - possibly the reason for its lateness (see above). Later on 37563 on K1-XL07 required cleaning, so 37156 took the 18.02 King's Lynn to Great Yarmouth . A couple of accidents on route tonight meant a few turns changed buses, in addition to which, 37573 which had arrived at King's Lynn at 18.07 (Y7-XL13) was then cleaned and turned out again for the 18.50 to Peterborough (L8-XL14) in place of 37564 which had a gearbox fault. Oh Dear ! 37156 suffered a recurrence of its ABS fault on Saturday morning, so 37579 was driven over to Great Yarmouth at some early hour, in order to work Y13-XL19. Not sure if a coach would have worked, had this movement not had taken place. 37579 dashes through Walpole Highway almost on time on Y13-XL19 this lunchtime. Finally to Sunday then and 37572 was noted heading to Peterborough 16 late this afternoon by Bruce. 37577 on XL06 which normally works the Martham service on arrival in Lowestoft, instead came back on XL08 instead of 37565. It was a busy day for unscheduled swaps with L10-XL10 changing 37568 for 37567 this afternoon and similarly XL07 having 37578 taken off in preference to 37570. This rather timely NHS advert is now being applied to some of our buses. To begin our round-up looking at the past ten days, we start with the last day of October. Many buses ran between 5 & 10 minutes late on this date. 37565 was once again involved in diagram swaps. It started on K5-XL11 but then came off at 10.30 after just doing a Lynn to Peterborough and back. It then had another trip over this section standing in for 37577 on L12-XL18, but the latter was fit to resume the turn at 14.02 and 565 retired to Vancouver Avenue. 37571 which came into Lynn on L10-XL16 at 10.07 was then turned round to continue on K5 back east at 10.32. Cheryl says - "Did you know that the bus ticket now has the bus fleet number on it ? This morning though, my ticket said 37570, but the bus was 37564. Best / Worst punctuality : 37573 on L10-XL16 a few seconds early on 10.48 Wisbech - Peterborough followed later by 37565 on L12-XL18 11.18 running 11 late. Y6-XL12 09.35 from Peterborough came into Wisbech almost 2 minutes early this morning with 37564 and it was quite an unpredictable day for timekeeping. L12-XL18 with 37569 was 8 late from Southgates on the 11.15 King's Lynn - Peterborough, but delays en route made it 14 late from Wisbech. 37579 was back having been out of service since Sunday with a recurrence of its water system problem. It worked K3-XL09 today. Over at Lowestoft, Malcolm reports 32651, 32654 and 34155 at the garage whilst Palatine 34156 was active on the 12.40 X2 from Norwich. 37577 runs into Great Yarmouth on K3-XL09 this lunchtime. Photo courtesy of Jamie Armstrong. I was absent today, but Bruce kept his eye on things for me. Y6-XL12 changed buses, starting out with 37578 and finishing with 37160. L8-XL14 began with 37575 and 37578 then replaced this. Des reported a slight delay at Middleton this morning after a pick up truck had embedded itself into a lamppost. 34156 was working the 14.08 X2 out of Lowestoft. Surprisingly after a period of stability, 37160 on L9-XL15 failed today with an alternator fault and with 37563 (injector sleeves) and 579 (water) stopped and 37158 requiring servicing, the service appears to have been cancelled at Lynn resulting in the 15.55 Lowestoft - King's Lynn producing the rare sight of Paragon coach 20515. Another B7 in trouble today was 37157 which had a 10 minute late departure from Gorleston on Y10-XL16 07.15 to Peterborough after its offside headlight blew. The bus had to be powered down to have a replacement fitted and on powering up afterwards, the ticket machine failed and had to be removed and reset. Earlier 37571 on Y6-XL12 had arrived in Lowestoft 15 late. Richrd Tucker's (at times seemingly one man) crusade to maintain a low floor service on the X1 saw coach 20515 returned empty to Great Yarmouth this morning. The X1 service itself was entirely B9 Gemini worked. Norwich bus station was once again closed for roof repairs with all buses entering from Surrey Street and using bays 14 & 15 then exiting via Queens Road. This reminds me that I recently had an email from Pat asking why the X1 doesn't exit Norwich via the railway station. I couldn't answer her but assume it is a matter of it taking longer ? 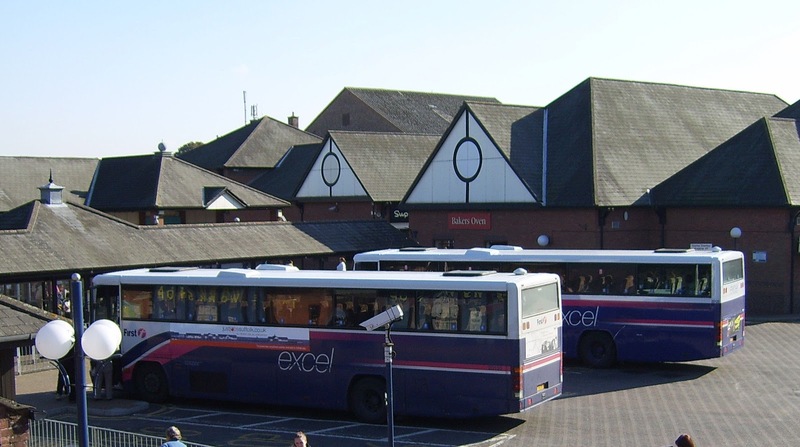 Peterborough bus station also has ongoing work and from tomorrow until Saturday, the X1 is using bays 5 & 17, then the week after bays10 & 20 for alighting and boarding passengers respectively. Better timekeeping today. 37570 worked L10-XL16 but 37158 deputised for the trip from King's Lynn to Peterborough and back. K1-XL07 had 37574 swapped for a repaired 37579 at some point. This evening there were two swaps with 37577 coming in on Y7-XL13 at 18.10 but after cleaning it took over K4-XL10 at 19.35 to Great Yarmouth in place of 37564. L11-XL17 arrived at 20.10 with 37576 and then went east with L8-XL14 21.35 to Gorleston relieving 37566. "Brrr" says Cheryl, "It's 37579 this morning and it's cold !". Well certainly 37578 is having its heating looked at, so maybe 579 needs to be seen too. The timetable went out of the window at lunchtime when temporary three way lights for manhole cover work at Black Drove near Thorney caused havoc. 37156 left Wisbech 6 late on the 11.18 to Peterborough (L11-XL17) but it got caught in the congestion and eventually reappeared past me at 13.52 running 62 minutes late. Subsequent eastbound services went by me as follows : L12-XL18 37572 44 late, Y13-XL19 37576 39 late, K14-XL01 37570 33 late and K15-XL02 37571 24 late. Earlier 37566 had already been 13 late into Lowestoft on K16-XL03 06 22 from Lynn. Des was driving K16 this afternoon and says "It all began well, with us leaving Southgates on time at 13.20. I had been instructed to travel via Whittlesey because of the A47 queues. Arrived rail station 21 late, departed bus station 15 late and back via A47 where the offending lights had just been removed. Some congestion still and departed Wisbech 24 late. Back at Southgates, my eastbound passengers were escorted over the road to catch a Lowestoft service which was just arriving. 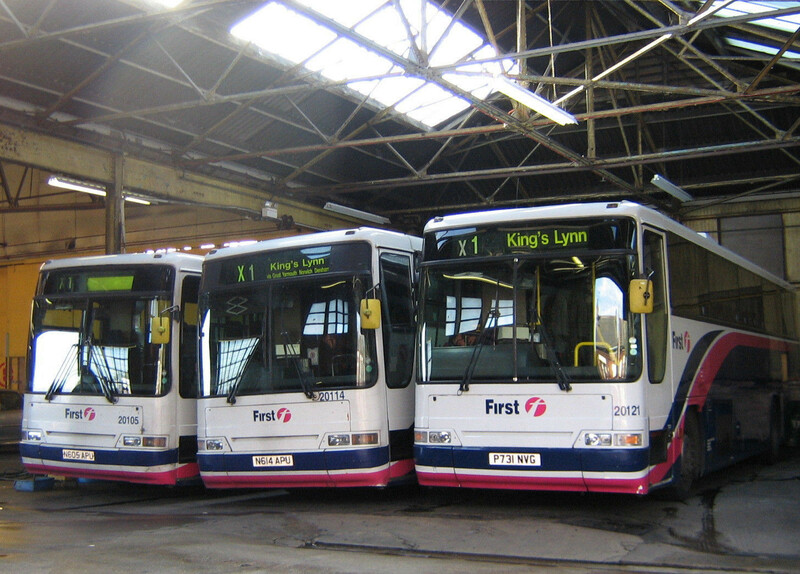 I deposited Lynn passengers at the bus station and then took 37566 to the garage". L10-XL16 seems to have been the first service badly affected by the works and 37578 was changed for 37564 for the 13.02 Lynn to Lowestoft. 37156 looks to have stayed on L11-XL17 but L12-XL18 had 37572 changed for 37565 which came from Vancouver Avenue to Lynn bus station after an adblue fault had been remedied. 37572 must have gone through though as it worked Y13-XL19 this evening instead of 37576. K14-XL01 which should finish at Lowestoft saw 37570 come back on the last leg of K15-XL02 to Lynn instead of 37571. Meanwhile, K19-XL06 14.45 King's Lynn - Peterborough with 37567 terminated / restarted eastbound at Wisbech as it is believed that the driver had run out of hours. For the second evening running 37577 off Y7-XL13 was required to work K4-XL10 19.35 Lynn - Lowestoft instead of 37573. 37563 remained off the road today awaiting injector sleeves. 37578 joined it idle with a retarder fault. Unscheduled vehicle swaps continue to occur. 37564 came off K2-XL08 today and was replaced by 37160 which has suddenly become very noisy. K16-XL03 was once again late into Lowestoft this morning with 37159 arriving 14 late. A quieter day with all the X1 Geminis appearing except 37563 & 37578. Y13-XL19 began with 37157 but 37567 took over at 11.45 from Lynn to Peterborough. At Lowestoft, the last of the new local liveried single deckers, 44518 entered service. 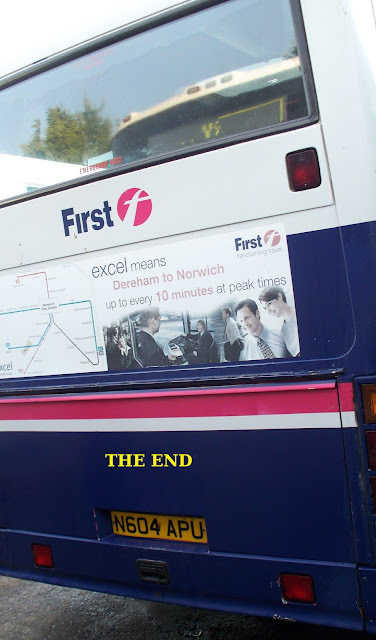 Very quietly, without any ceremony or fuss, an era ended this week when, after 17 years, the very last two B10M Premiere coaches remaining in revenue earning service with First in East Anglia were withdrawn from service. 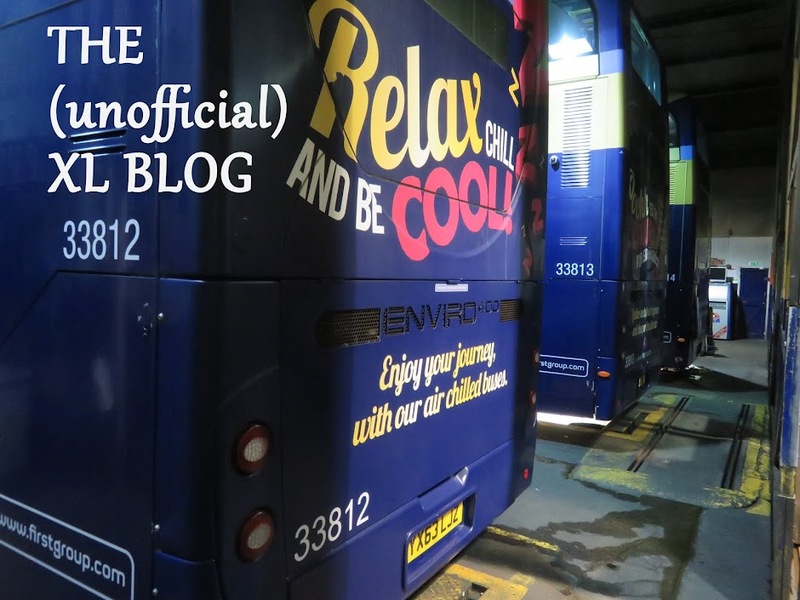 With a long history of use on the X1 route and before that the X94, it is only right that we should pay tribute in the blog to their longevity and comfort. Ironically, the last two coaches in use, 20102 and 20115 were amongst the rarest on the route over the years. 20102 had relatively recently arrived from Ipswich and was in white livery, while 20115 remained in Excel livery. Both have left Great Yarmouth, 20115 is believed to have been bought privately while 20102's fate is not definitively known - it had been out of use for a short time and whilst some reports say it has also been sold on for service, others state that it has gone for scrap. 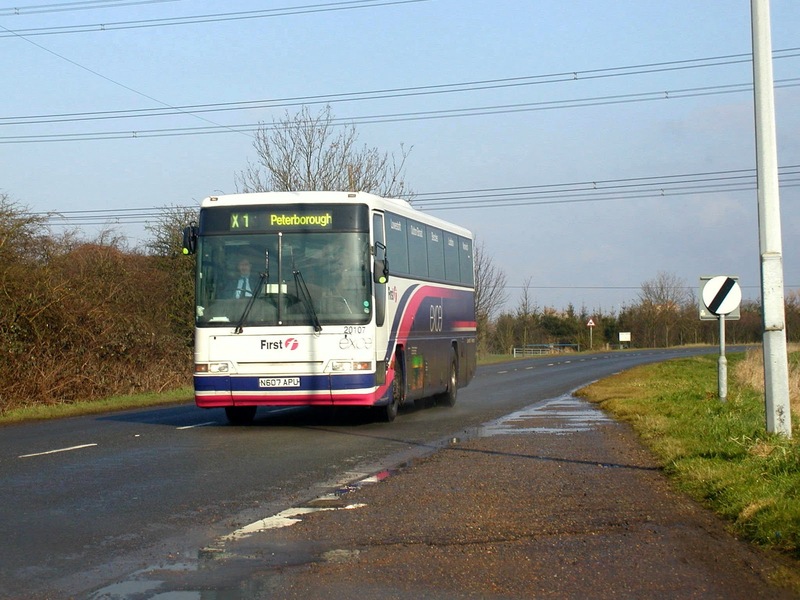 For the record, the last use of a Premiere on the main X1 (rather than shuttles) was on April 20th when 20102 worked L12 from Lowestoft to Peterborough and back to King's Lynn where a Gemini replaced it. 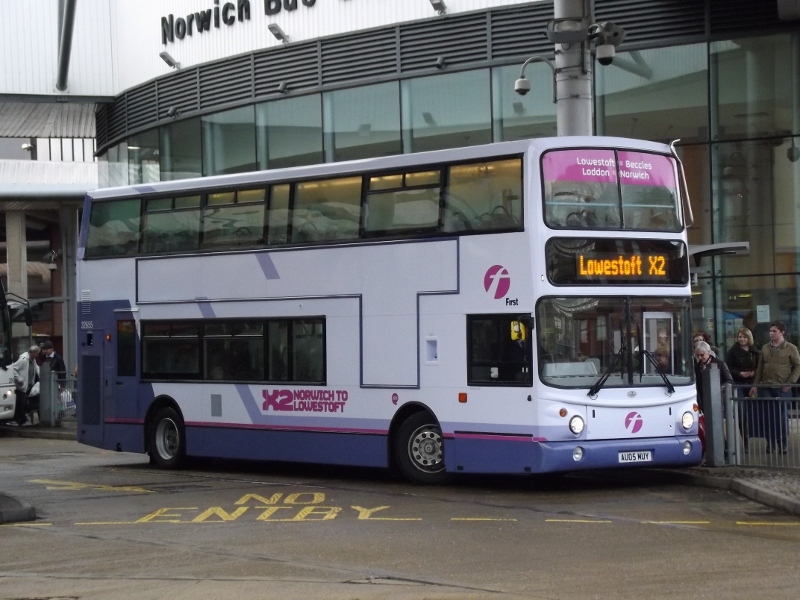 20115 had worked L12 throughout on Saturday February 25th and earlier on 6th had again appeared west of Norwich. This trio of workings were the only ones reported on the Peterborough - Norwich section in 2012. On 12th June 2007, 20105 gives way to 20101 to work the 20.42 King's Lynn - Lowestoft. 20101 new in 1995 was only pressed into use on the X1 in times of shortage as it had a faulty oil warning light and was usually to be found on the X2. On March 2 2009, Malcolm W is at the wheel of 20118 as she approaches Walpole Highway. April 2009 and 20127 is near Walsoken - she lasted in this livery until the end which came in August 2010. The side advertising was a recent addition. On July 27th 2007, two Barbie liveried Premieres stand outside King's Lynn garage. In a matter of weeks 20128 was to be relegated to be a driver trainer and 20126 was soon to get a repaint into Excel livery. 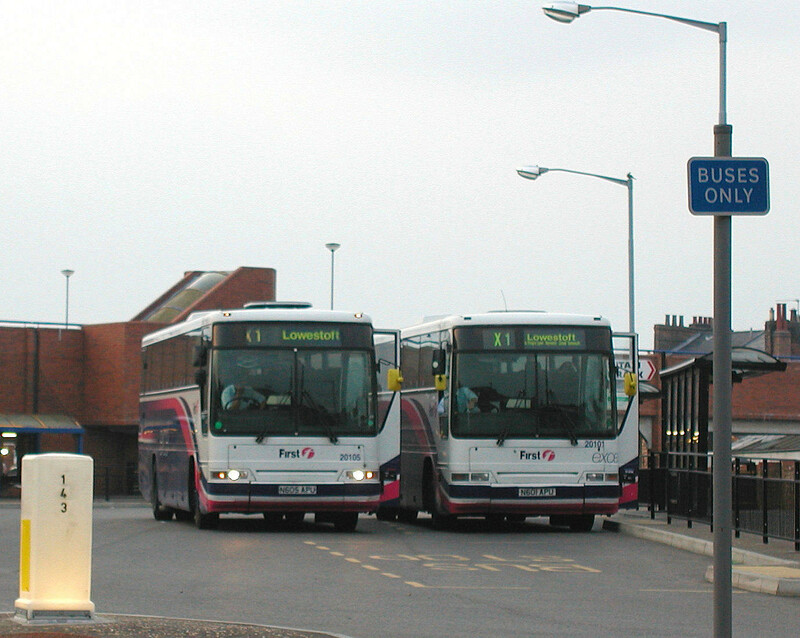 July 29th 2007 and a trio of B10Ms await their next duties at King's Lynn. 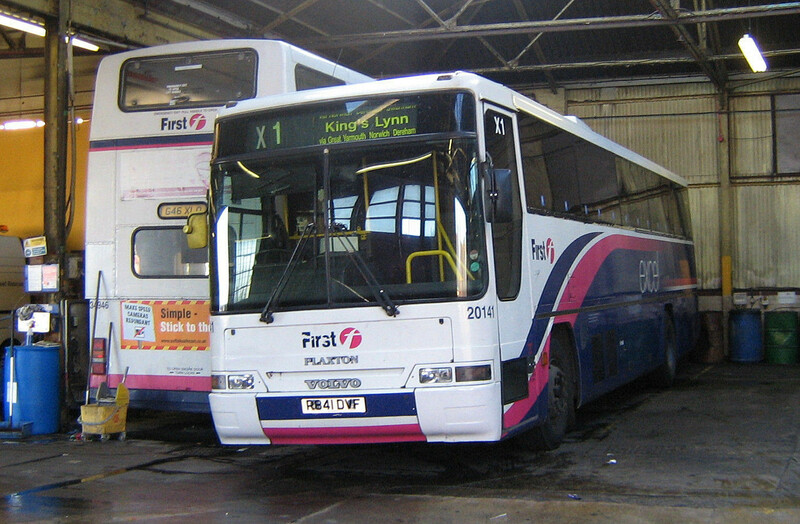 20105 was withdrawn whilst at Lynn, but 20114 went to Scotland and was later sold. 20121 - an original Eastern Counties vehicle in September 1996 - also went to Scotland but was sent back and performed more useful X1 work until a car ploughed into the back of it causing its final demise. On June 4th 2007 20141 was photographed with some temporary bumper panels in place. This vehicle has recently been back in service with Emblings of Guyhirn. 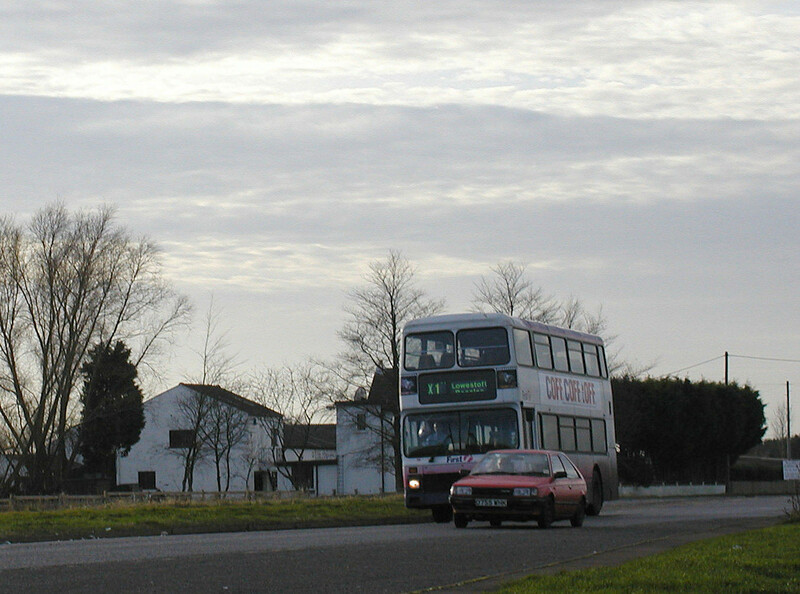 1st March 2008 and locally registered 20120 gets away from Hardwick roundabout on its first journey following a period out of service. It lasted until the end of August 2008 when it was withdrawn following crankshaft failure. 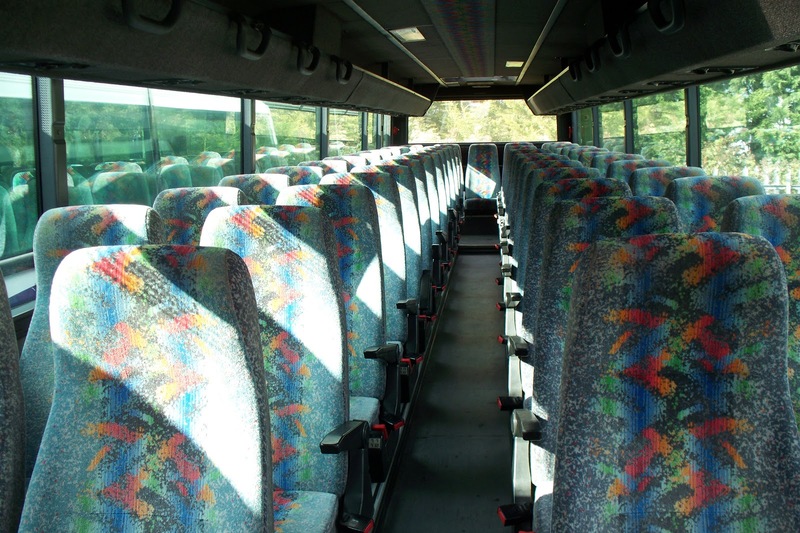 The comfortable interior of 20118. 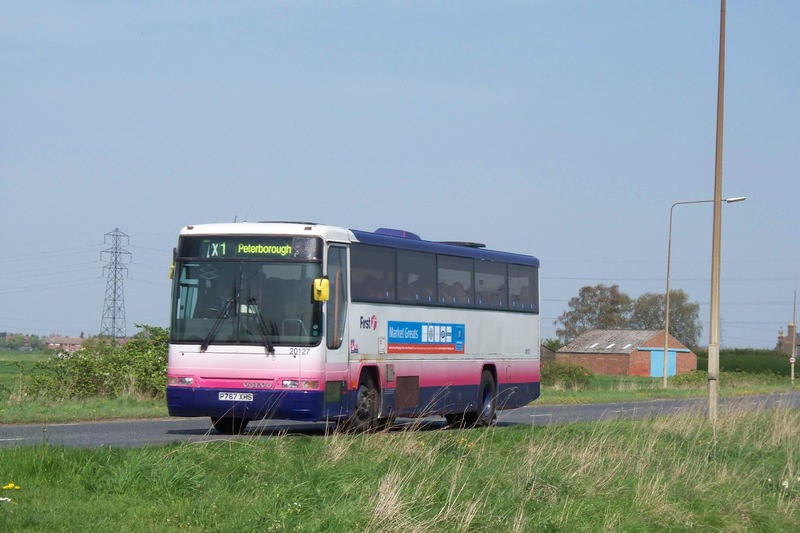 Peter writes : "Hi Gerard, I read recently that your friend Victor Meldrew had complained to Peterborough City Council on a number of occasions about the lack of bus information at Peterborough Railway Station following the multi-million pound refurbishment. At the time I did think "What a moaning old geezer" but it seems like he's had some success. 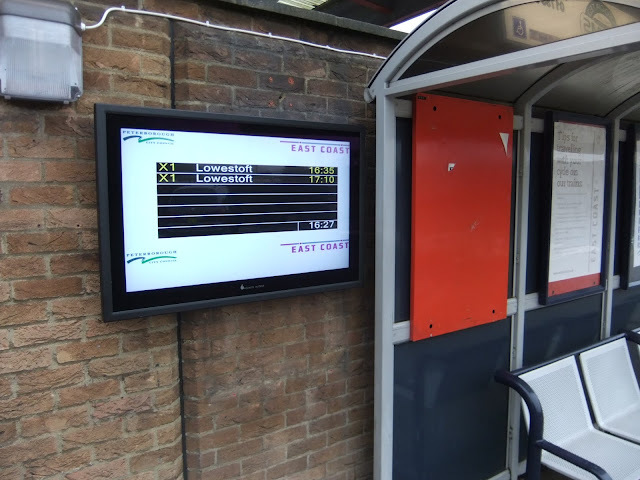 I think a poster in the (still empty) poster case would have sufficed, but the Council and/or East Coast have gone completely overboard and provided a 32" LCD screen exclusively for X1 ! I was about to write to write to you to tell you how happy I was (there's a change - Ed) that a new information screen has now been provided at Peterborough railway station, when I tried printing the new X1 timetable. Please see my attachments - the first page printed fine, but every page after that was printed in some sort of hieroglyphic code! I thought that perhaps it was my printer or computer so I tried it on a different printer and computer but with the same result. 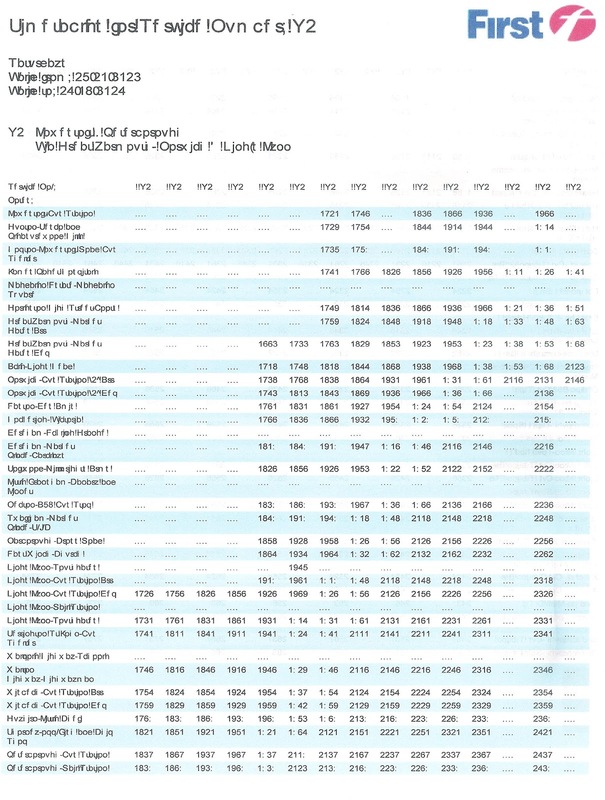 Do you realise how much it costs to print 16 colour pages with the price of ink these days?! Please have a word with your friends at First Group and get them to sort out their website. Oh well you can't please all the people all the time and you can't please Victor at any time ! 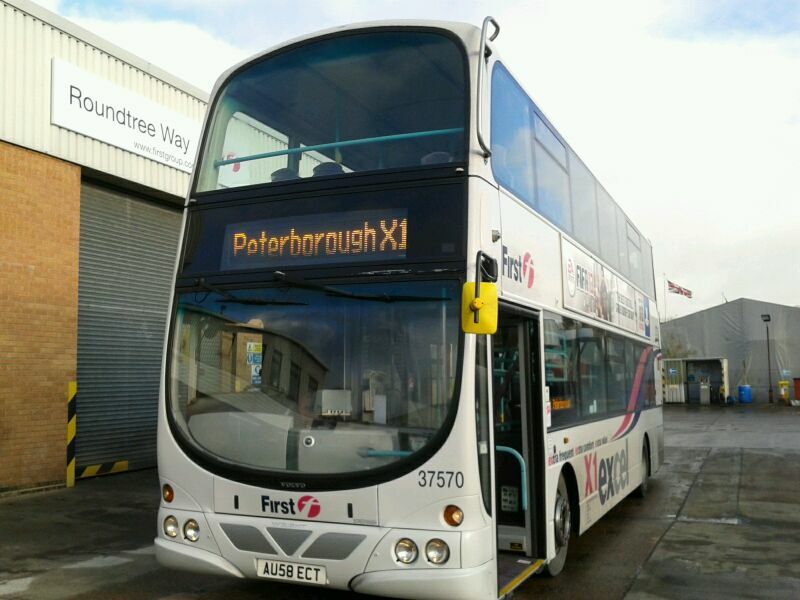 Now the first reported appearance of one of the new Paragons on an X1 shuttle occurred on the 22nd when Kieran Smith saw 20515 in service along with veteran B10M 20115. Kieran adds " These shuttles arrive in Norwich bus station from the Queens Road end and depart via Surrey Street exit to reach Bracondale". On Tuesday 23rd, alll went well until L11-XL17 10.45 King's Lynn - Peterborough which appeared 30 minutes late through Wisbech with 37158. The services either side ran on time, so the reason for the delay to L11 was not clear. K15-XL02 with 37565 had an adblu sensor fault and was replaced by 37576. At Lowestoft 37570 on K16-XL03was seen arriving 15 late this morning by Malcolm, but this had all been regained by the time it passed me at 13.50. On Wednesday 37564 was taken out of traffic for attention to its injector sleeves and with 37579 still awaiting MOT, this left just one spare bus. First change of vehicle was on K5-XL11 when at 10.32 37160 was relieved by 37156. 37570 on L12-XL18 was unable to continue from King's Lynn to Peterborough at 11.15, so 37160 was summoned to do the Peterborough leg and 37570 was fit again to work to Lowestoft at 14.02. 37563 on K14-XL01 was removed at 15.00 and 37160 then continued its day as the 15.02 to Lowestoft. Most services were a few minutes late, but nothing in excess of 10 minutes was recorded. Remarkably 37157 on Y9-XL15 left Wisbech 4 late on the 10.18 to Peterborough, but returned a few seconds early just before 11.50. On Thursday, morning services in the west suffered minor delays. Temporary traffic lights at the entrance to Wisbech Horsefair bus station and also on Nene Quay didn't help matters. By the afternoon things had improved although an accident at North Tuddenham caused tailbacks for westbound services. 37575 on K5-XL11 was halted at Eau Brink at 17.30 with a snapped alternator belt, so 37576 went out to replace it. After completing K5, 37576 then replaced 37571 on Y6-XL12, the 20.35 to Great Yarmouth. 37579 was back on the road after a morning MOT replacing 37565 on K15-XL02 12.45 King's Lynn - Peterborough etc. At Lowestoft 37159 was seen on Y7-XL13 and L8-XL14 was also, most unusually, a B7 with 37158 and this arrived 17 late.37157 on K18-XL05 departed Lynn 5 late on the 17.02 to Yarmouth and arrived here 14 late due to traffic conditions. Friday 26th saw 37574 on L8-XL14 in trouble at Peterborough with a water leak. 37565 took the 10.35 to Lowestoft forward, starting at either Wisbech or Lynn. Punctuality was average with a poor spell at lunchtime when K15-XL02 (37566) was 15 late in both directions through Wisbech and Y13-XL19 13.05 ex Peterborough (37567) passed through eastbound 19 late. 37571/8 were undergoing safety services at Vancouver Avenue. 37158 was losing time again, this time on Y9-XL15 - it was 20 late arriving at Lowestoft and 10 late departing westbound. 37157 on Y7-XL13 was also an offender today, 19 late into King's Lynn from Lowestoft at 18.26, not helped by an 8 minute delay waiting to exit Hockering back onto the A47. Three Enviro 200 single deckers with Lowestoft branding entered service here today on locals. Noted were 45117/8/9. On to Saturday and I had a journey to the Midlands to watch Aston Villa v. Norwich. I passed K4-XL10 in both directions with 37578, as well as a few others. Services ran reasonably and the only swap was on K18-XL05 which exchanged 37156 for 37159 this afternoon. 37567 & 37159 required replacement windscreens. Remember these ? Well 60814 was one of the vehicles in use on X1 shuttles today. Many thanks to Kieran for the photographs. On Sunday 37579 once again had water problems and 37571 replaced it. The half term week began with lighter traffic and 37565 on Y6-XL12 09.35 from Peterborough came into Wisbech at 10.18 (2 minutes early) which is possibly a record. 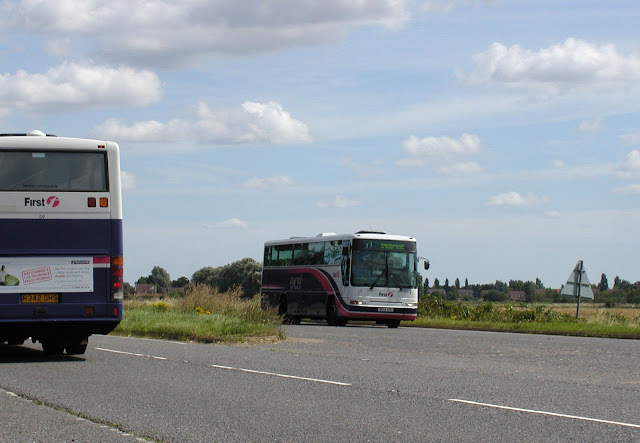 A trio of B7s mid morning saw 37157/9/8 appearing on Y9-XL15, L10-XL16 & L11-XL17. Y9 was 21 late going east, while L10 was just 3 late and L11 14 late westbound. These were the worst delays I noted but Des adds "An RTA at Guyhirn caused problems and the Acle Straight was closed by a similar incident from 14.00 - 22.00, I was supposed to drive 37159 on L10-XL16, but this was 30 late, so instead when 37158 came in empty to Vancouver Avenue at 13.55 having been on L11-XL17, I took this instead going light to Norwich arriving at 15.05. Here Y9-XL15 was just departing, so after consultation with Lynn control I went light via the A146 to Lowestoft to form Y9's return working at 15.55. 37157 meanwhile was seen in Gorleston by now running a whopping 95 late !" To bring us up to date, Tuesday October 30th was an A47 day with broken down vehicles at Guyhirn and Blofield causing delays. 37158 on K5-XL11 09.05 Peterborough - Lowestoft came into Wisbech 17 late and was 24 late from Lynn eastbound Y6-XL12 may have travelled via Wisbech St. Mary as it was not noted on the usual route. There was quite a business this morning when 37159 failed en route on K16-XL03 - it is believed to have had a faulty drivers seatbelt. 37157 and 37565 were despatched from King's Lynn and 37159 was seen in a layby near the Mattishal turn by Nick Youngman. 37565 eventually took over K16 and was seen by Malcolm departing Lowestoft 17 late on the 09.55 to Peterborough. 37159's ailment was sufficiently trivial to enable it to resume working K16 at 13.15 from King's Lynn. 37565 was later seen on K3-XL09 having relieved 37567. Malcolm also reports Y7-XL13 with 37576 arriving at Lowestoft 22 late, having been only 6 late when seen at Wisbech. X2s were also delayed today typified by Palatine 34156 arriving 22 late on the 13.10 from Norwich. The following service was only 5 late, remarkably with another veteran, 34155. Another smart new arrival 44928 was seen on town services today. The very first advert to be fitted to an X1 Gemini was for the 22nd Bond film Quantum of Solace back on November 13th 2008. Now four years on it's time for the 23rd title seen adorning 37566 here. With X1 vehicles due for replacement next year, it will be interesting to see if any of the present fleet notch up half a million miles. This will depend on when the new buses arrive - when the 17 X1 liveried Geminis arrived, it wasn't until October and if this is replicated, several will easily pass this mileage. These are thousands in miles, not kilometres. For those of you not quite as obsessed by figures as me, I ought to point out that 37572 has travelled 756k kilometres ! 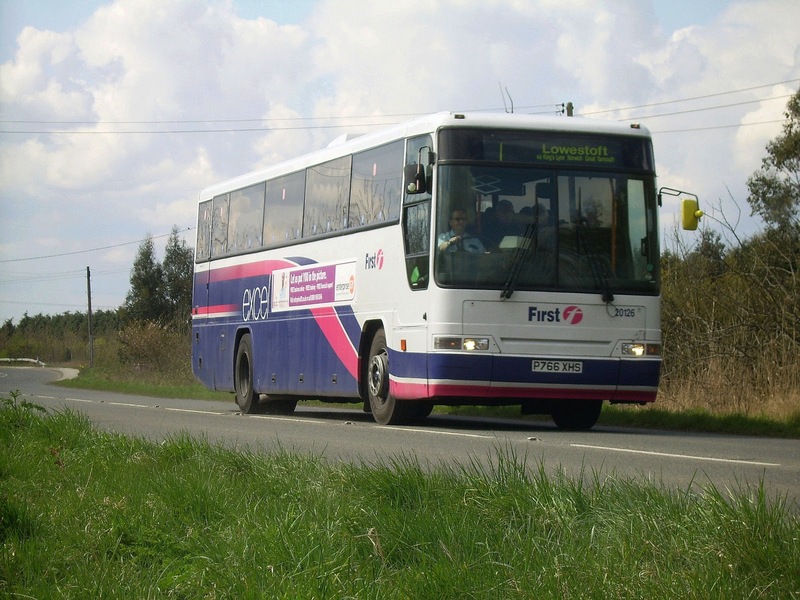 37571 was the bus involved in the Thorney accident hence its low mileage - it was off the road for 15 months and was given a new cab already fitted with a speedo reading 31,000 more than that actually travelled by 37571, so this adjustment of subtracting 31,000 from the actual reading has to be made to obtain an accurate figure. It is also quite amazing that 37572 has now run 50,000 miles more than 37566. The latter has always been unlucky and on its first day in service failed (24.10.08). It was on the road three weeks before 37572. It is hardly surprising perhaps that minor ailments at last seem to be on the increase with the B9s. On the evening of Tuesday 16th 37563 failed at Thorney with a burst water pipe whilst on L8 (XL14). The turn resumed at 21.35 from King's Lynn to Gorleston JPH with 37568 which had come off K5 (XL11). 37572 & 37573 were serviced today and K1 (XL07) began with 37578 but this only managed a trip from Lynn to Peterborough and back before being replaced by 37157. At 12.15, 37579 had to be taken off K14 (XL01) with a water system fault and 37578 was fit to take over. Timekeeping was very good with only minor delays, despite roadworks with temporary lights at Necton. Wednesday 17th was not so good for punctuality. 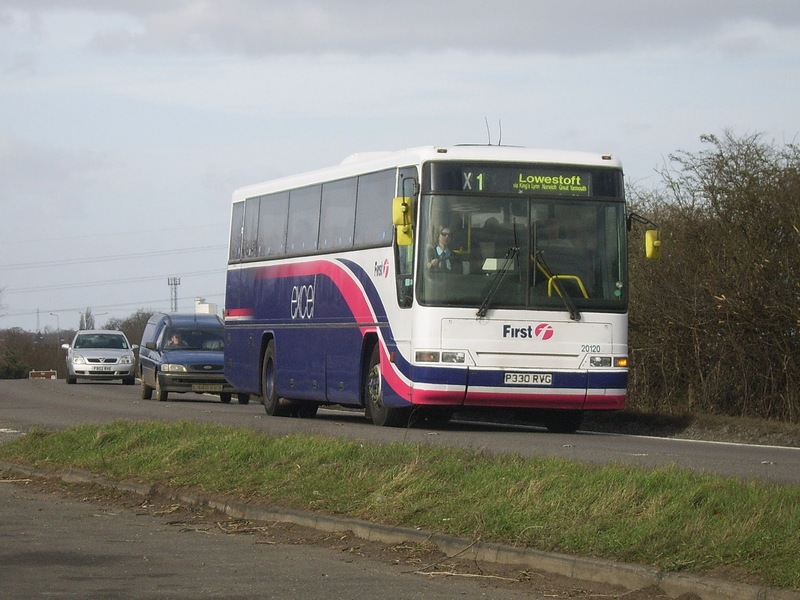 Y6 (XL12) is normally good for timekeeping, but the last few weeks have seen a marked deterioration, presumably due to morning peak traffic in King's Lynn and Wisbech. 37568 departed 12 late from Wisbech westbound this morning at 09.00 and going east at this time was K3 (XL09) with 37574 also 10 late. By this evening a change had occurred and 37567 was on this turn. This was delayed at Walsoken by an ill passenger on the 16.15 from King's Lynn to Peterborough. Back to the morning and Y9 (XL15) with 37157 contrived to be 19 late from Wisbech on the 10.18 to Peterborough. things then reverted to timetable until K15 (XL02) 13.18 departure which left 15 late with 37577. There were a lot of swaps today. 37566 had an adblu problem whilst working K17 (XL04) and at 13.45 was replaced by Tuesday night's poorly bus 37563. K5 (XL11) had 37569 taken off at teatime for a rejuvenated 37566 to run from Lynn to Peterborough and back at 17.15. Finally Y6 (XL12) had 37568 taken off at 20.30 and 37156 went forward at 20.35 to Lowestoft. Thursday 18th saw some services delayed, but others run on time or even slightly early ! Again Y6 (XL12) was delayed this morning and the 08.48 to Peterborough didn't get away from Wisbech until almost 09.00 with 37565. Mid morning saw a trio of B7 workings heading west. Y9 (XL15) with 37159 was 8 late, L10 (XL16) had 37158 and L11 (XL17) with 37156 passed me at 11.37, 17 late. Of the other B7s, 37157 on K16 (XL03) managed a rare on time appearance, but 37160 on K18 (XL05) came through 15 late. Traffic on the Peterborough section must have been light, 37570 on K17 (XL04) was 7 late departing Wisbech on the 14.18 westbound, but came back a minute early. Today's A47 roadworks with traffic light control were at Little Fransham. The water system fault on 37579 saw it being stripped down at Vancouver Avenue while 37574 joined it over the pits with an adblu fault. Punctuality was better than the average on Friday 19th and it was not until late afternoon that delays began to build. About the worst of these was 37158 on K3 (XL09) which was 11 late into Lynn from Lowestoft to form the 16.15 to Peterborough. It was noted leaving Wisbech 15 late. 37160 had air pressure problems at Yarmouth first thing and it was eventually able to work Y9 (XL15). An accident near Thorney apparently caused delays in the early evening and 37568 on K4 (XL10) needed cleaning on arrival at Lynn, so 37567 worked forward to Lowestoft at 19.35. 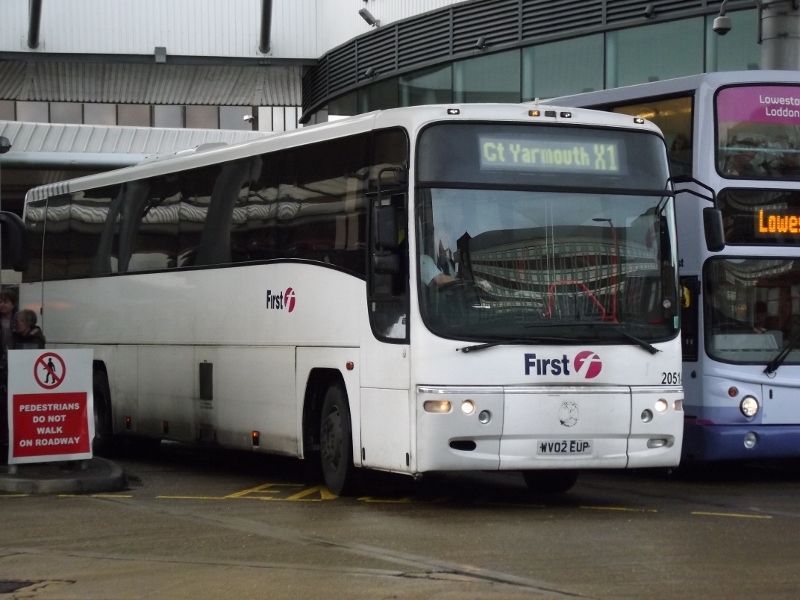 Christine spotted old friend coach 20115 still earning its keep on an X1 short today, seen in Norwich at 08.20. On Saturday early morning services were on the dot. I nearly fainted with shock when K5 (XL11) 09.05 Peterborough - Lowestoft (37160) and L8 (XL14) 09.48 Wisbech - Peterborough (37567) both passed each other at the Clarkson memorial both running a minute early. Overall things seemed to run fairly well. Once again Christine noted 20115 in use on the shorts - doubtful if it will get another MOT ? 37579 will be getting an extended break from service as it is now on MOT prep. Sunday saw nothing noteworthy and Monday 22nd saw another bad start to the week for Y6 (XL12) 05.50 ex Great Yarmouth with 37569 crawling in a queue into Wisbech 15 late. K3 (XL09) going east was similarly 14 late with 37159. This was as bad as it got though and the rest of the day went quite well. 37569 had to be removed from Y6 (XL12) tonight and 37158 off K5 (XL11) was its replacement. Many thanks to Malcolm and Cheryl for their help this week. Several people have contacted me recently in praise of the X1. Steve says "Can't praise the X1 enough, I can't drive now due to a health condition and as I'd always been a car driver, I'd failed to realise what a great service the X1 gives. I'm now a regular user and suddenly, losing my ability to drive no longer seems like the end of my world". Vicky is also impressed by the service, she says " Am I the only person who has travelled all the way from Wisbech to Lowestoft ?" - well no as we have seen recently, she continues "it's a brilliant service and if they had a fan club I'd be a member". Can't be bad Vicky. Just lately punctuality and reliability has not made for an exciting blog, but at least it has been good for the passengers. On the evening of 6th, 37157 was failed at Peterborough on Y10 (XL16) with an electrical fault. It had to be towed in by a recovery team in the early hours of Sunday. 37158 saw unusual use on Sunday - it worked Y8 (XL08 Sun) until it ws removed at King's Lynn as it required a Monday morning examination. 37566 worked the turn forward. 37564 was stopped for MOT today. 37158 was released off maintenance to work K5(XL11) and it then had an extended day by replacing 37570 on L8(XL14). The reason for this change was to enable the all over rear ad (or what remained of it) to be removed. Y7(XL13) had a change of vehicle after 37573 failed at Swaffham with loss of power - a turbo intercooler pipe needed replacing. 37567 is thought to have been used to replace it. 37157 was given a clean bill of health after repairs. 37157 was back on the road working K3(XL09) today. 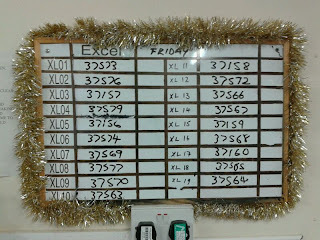 K18(XL05) had 37160 swapped for 37563 for servicing requirements. 37577 on K2(XL08) suffered a water leak at Wisbech just after 18.00 and 37573 worked forward from Lynn at at 18.35. Y6(XL12) with 37565 was the most delayed service noted, 12 late from Wisbech on the 08.48 to Peterborough, but just 5 late returning. King's Lynn garage have taken delivery of this smart dedicated fleet support van for those odd occasions when the X1 misbehaves. Not a bad day and only one vehicle swap, 37576 coming off Y13(XL19) at 21.45 for a sister to do the final leg to Peterborough and back. Over at Lowestoft things weren't quite as good with K16(XL03) arriving 19 late and departing 10 late on the 09.55 to Peterborough, but by the time it reached me it was down to 6 late. The bus was 37158. Most services seen at Lowestoft were slightly late, 37568 on K17(XL04) was 6 late in and 37160(XL05) on K18 8 late. 37563 on Y6(XL12) this afternoon managed to be on time, but 37159 was 18 late in on Y7(XL13) and 10 late going back to King's Lynn. 37564 had its MOT this morning and was then fit to replace 37571 on K15(XL02). The other rested buses today were 37565 & 37576 for servicing. Last week Dennis Trident 33165 spent a week on the X2 on loan and today Malcolm reports 33057 in Lowestoft bus station, believed to be a new reallocation from Norwich to replace two Darts which have gone the other way. By Friday standards, not a bad day for timekeeping. Passing Wisbech K18(XL05) and 37159 was 14 late westbound and had made up a minute returning east to do the 16.26 to Yarmouth. K1(XL07) with 37573 was 17 late on the 15.48 to Peterborough, but everything else ran fairly well. 37576, 37578 and 37157 were the spare buses today. At Lowestoft, Malcolm viewed several services but only 37564 on K17(XL04) was behind time to the tune of 9 minutes. Des says "It was me on K18(XL05) and the catalogue of woe is as follows : 37159 departed Southgates 7 late, congestion into Wisbech departed -14, Arrived Peterborough 15.41 and explained to rail station passengers we would be going there after loading. Departed to rail station at 15.49 and left there at 15.53. 14 late from Wisbech at 16.40. Departed Lynn bus station at 17.10, just 8 late but then took 14 minutes to reach Southgates due to Friday peak traffic. My journey home was with 37573 on K1(XL07) on which we departed Southgates 14 late and never regained much time. 9 late into Great Yarmouth as a result". I admit to seeing very little today, but my correspondents kept me posted. 37565 and 37569 swapped turns at some point today with them ending up on K14(XL01) and Y13(XL19). A nice all B9 worked day : 37563/4/7/8/9. 37571/2/5/7/8 were in use. Brasenose Avenue in Gorleston was shut today necessitating a diversion via Middleton Road. The new X1 timetable headings all show Peterborough - Lowestoft and no westbound service, fortunately the times themselves are correct. Driver illness forced the cancellation of L12(XL18) 07.45 Lowestoft - Peterborough as far as Norwich where one of the King's Lynn controllers came to the rescue with 37157. This was later taken off the duty and was seen lurking in Vancouver Avenue at 15.30. Later passengers waiting for Y6(XL12) 17.45 King's Lynn - Peterborough were boarding 37568 when it was decided to replace it with 37566. Howard Street in Yarmouth closed for resurfacing meant more diversions and the Hardwick roundabout is once again closed to evening traffic from 20.00 until 26th. New X1 Timetable with enhanced frequency in the East ! In addition to the daytime half hourly Lowestoft - Peterborough service, there are of course the so called X1 shorts linking Gorleston, Great Yarmouth and Norwich at peak times. Well from 14th October, these additional services are being augmented into a regular frequency timetable which will mean extra services from Yarmouth at 27 & 57 minutes past the hour and eastbound from Norwich at 10 & 40 minutes past the hour.